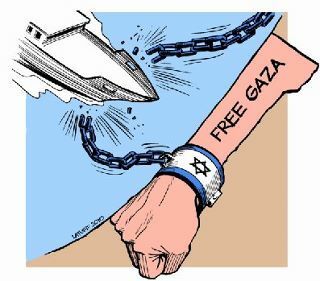 In a statement today Sinead MacLochlainn National Chair of the Irish ship to Gaza Committee condemned the reckless behaviour of Israeli Forces as they violently seized the Saoirse and Tahrir boats on Friday. She was speaking as the following harrowing account came through from one of the Irish hostage in Govin Prison. They were not murdered, which is the fate of other victims of the Tel Aviv regime. Violent and dangerous…..not to mention ILLEGAL! But then, international law has never been an interest for that little terrorist nation, Israel. They’ve been producing evil for 60 years. You are dealing with punks. deal with their boss. Try Buckingham and The City of London first. Get these good people out.